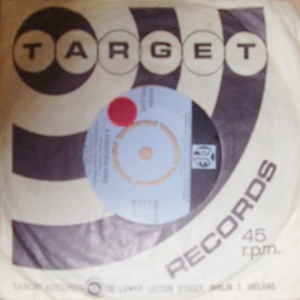 Target was started by The Tom Costello Organization in 1967. The address on the company bags is 65 Lower Lesson St, Dublin 2. 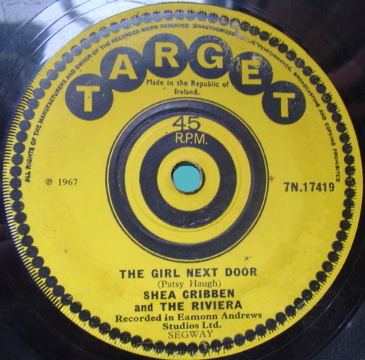 Target's products were distributed in the United Kingdom by Pye records and hence they used the same numbering and catalog system as Pye (Info from Paddy Brennan's Golden Era of Irish Showbands). Apparently every Target release has a Pye UK equivalent pressing. A full list of Irish artists released on Pye is also available here. Not to be confused with the mid-70s pop/soul label that was the home of The Marmalade, The Nolan Sisters, Blue Mink, etc. An oddity: a UK press of 45059 on a white Target label (without the familiar logo) and a TS prefix. Johnny McEvoy ("Nora"? ), The Real McCoy and others.